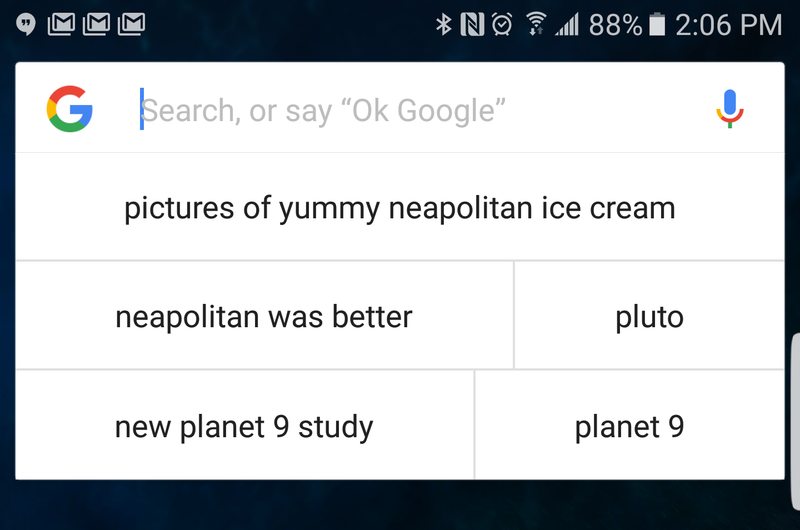 The next time you do a search on your phone, you may notice something unusual—the search history drop down has a new look. Well, it's new for some people. It's more compact with search terms in a series of blocks. This appears to be the default for a few users, but everyone can try it with a little keyboard trickery. The search history appears when tapping on the home screen search widget or the search widget in the Google search UI. It's looked the same for years; just a few lines of recent searches. The new UI takes up less space because multiple shorter search queries can share the same line. To trigger this on your device (if it's not the default), enter a space before typing a few characters. When you delete them, you should see the new search history. The arrow next to search terms is gone in the new history. The arrow currently lets you drop a search into the search bar so you can edit it before searching. Tapping the search terms immediately triggers that search again. You can edit after that, but it's slower. You can still long-press to remove search terms in the new UI from your history, though. The compact search history has been showing up intermittently for a few weeks—someone on Reddit spotted it earlier this month. I wouldn't be surprised to see this become the default soon.